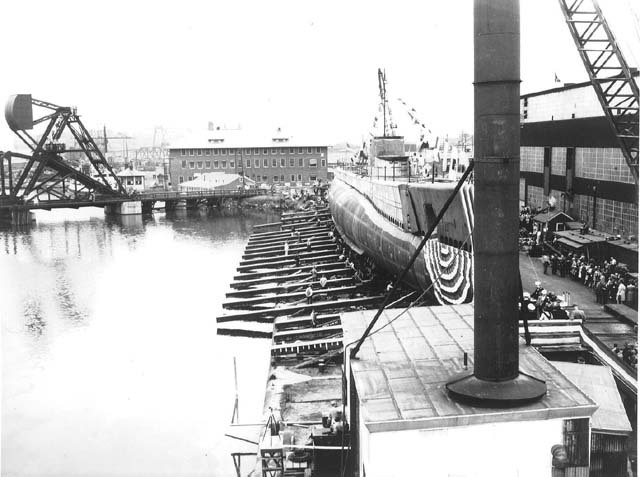 Balao Class Submarine: Laid down, 1 May 1944, at Manitowoc Shipbuilding Co., Manitowoc, WI. 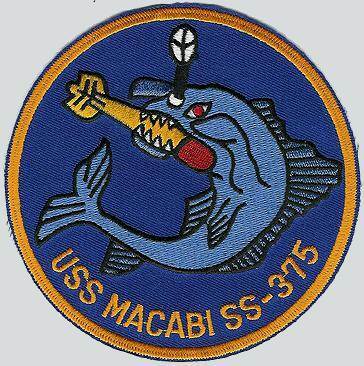 ; Launched, 19 September 1944; Commissioned USS Macabi (SS-375), 29 March 1945; entered Mare Island Navy Yard 12 December for inactivation overhaul and decommissioned 16 June 1946; Laid up in the Pacific Reserve Fleet; Recommissioned, 6 May 1960; Decommissioned, 11 August 1960, and transferred (loaned) under the Military Assistance Program to Argentina, renamed Santa Fe (S-11); Struck from the Naval Register, and sold outright to Argentina, 1 September 1971; Final Disposition, deleted and broken up by the Argentine navy for spare parts in 1972. Specifications: Displacement, Surfaced: 1,526 t., Submerged: 2,424 t.; Length 311' 9"; Beam 27' 3"; Draft 15' 3"; Speed, Surfaced 20.25 kts, Submerged 8.75 kts; Cruising Range, 11,000 miles surfaced at 10kts; Submerged Endurance, 48 hours at 2kts; Operating Depth, 400 ft; Complement 6 Officers 54 Enlisted; Armament, ten 21" torpedo tubes, six forward, four aft, 24 torpedoes, one 5"/25 deck gun, one 40mm, one 20mm, two .50 cal. machine guns; Patrol Endurance 75 days; Propulsion, diesel-electric reduction gear with four General Motors main generator diesel engines, 5,400 hp, Fuel Capacity, 116,000 gals., four General Electric main motors with 2,740 hp, two 126-cell main storage batteries, two propellers. 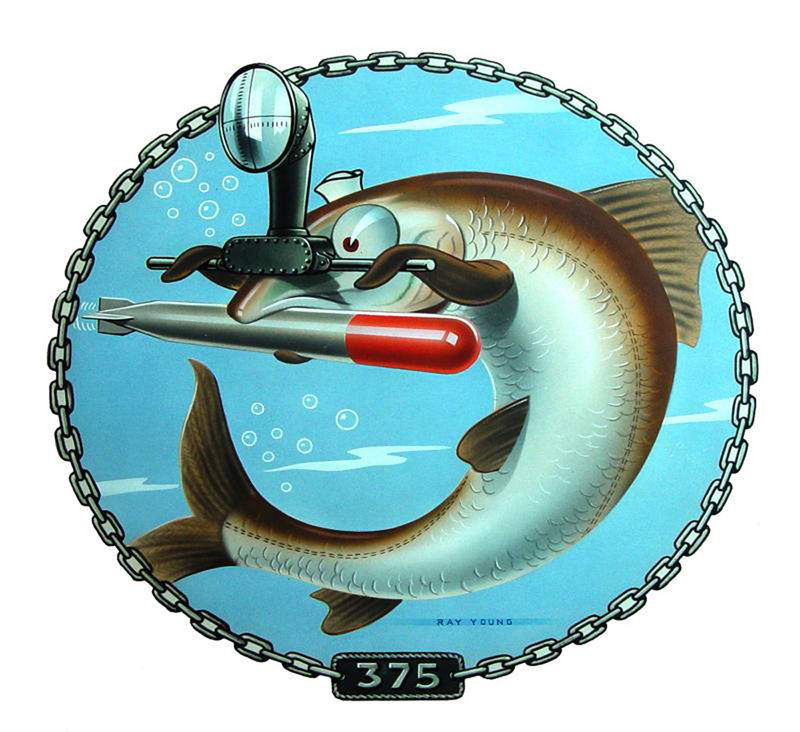 284k Insignia of the Macabi (SS-375) designed for the submarine by Ray Young, circa 1944. 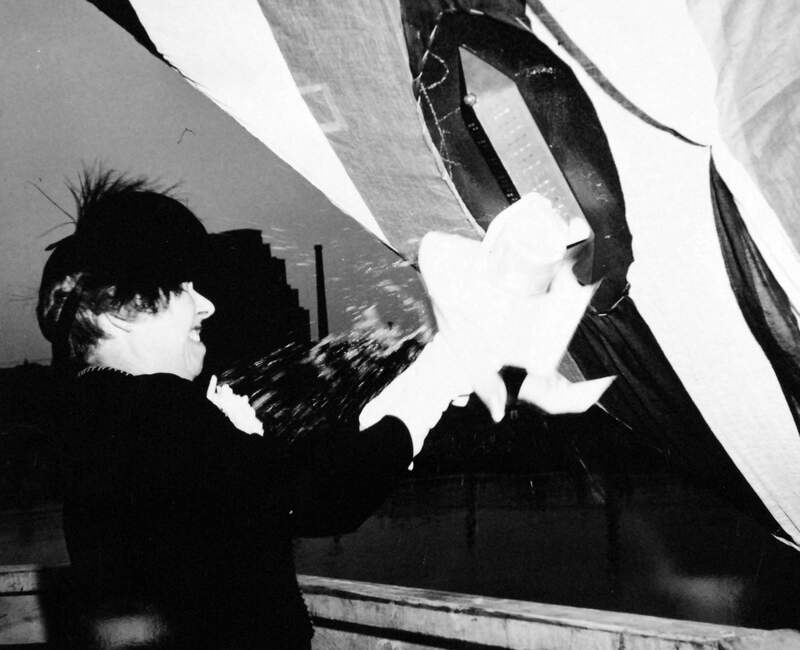 Photo by Ray Young, courtesy of his son, William Young. 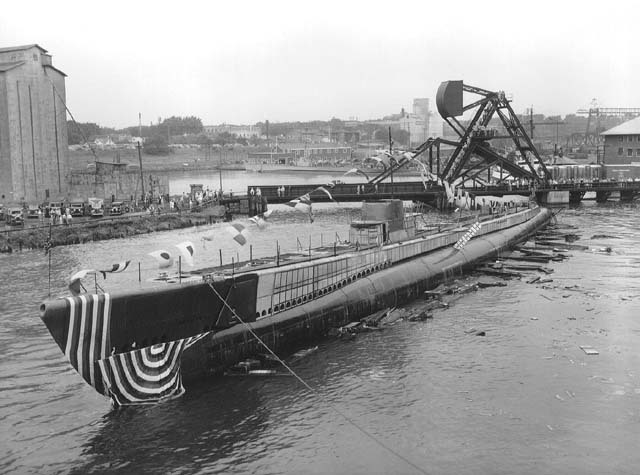 355k Macabi (SS-375) at launching at the Manitowoc Shipbuilding Company, Manitowoc, Wisconsin, 19 September 1944. Shown: Mrs. Arthur S. Carpender, wife of Rear Admiral Carpender. USN photo # 80-G-409538 courtesy of National Museum of the U.S. Navy. 52k Macabi (SS-375), starboard bow view, preparing to be launched at Manitowoc Shipbuilding Co., Manitowoc, WI., 19 September 1944. None of them would have seen the light of day if it were not for the efforts of Curator, Asst. Director, Bill Thiesen and Larry Bohn who sent them to NavSource for publication. 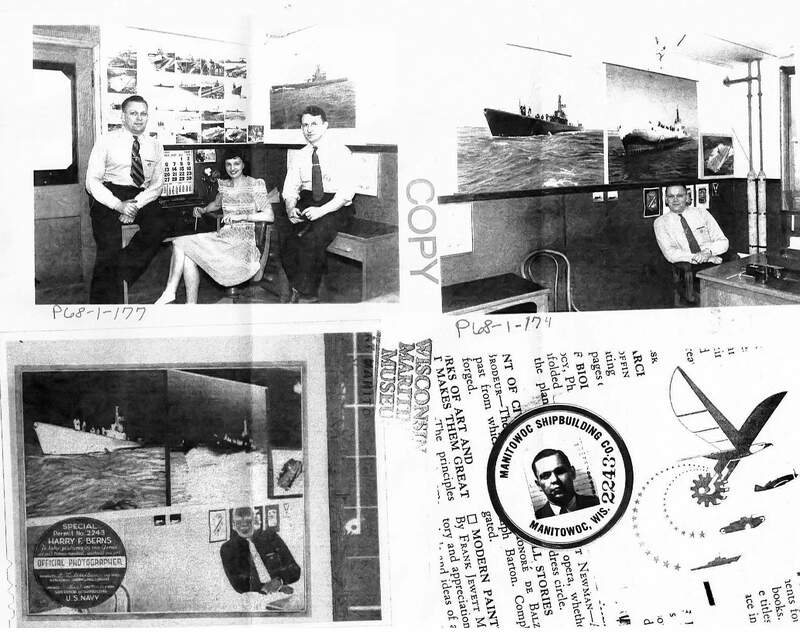 A special debt of gratitude is owed to these two men and the Wisconsin Maritime Museum, home of the Cobia (SS-245) for allowing these photographs to be seen by the lovers of naval history worldwide. 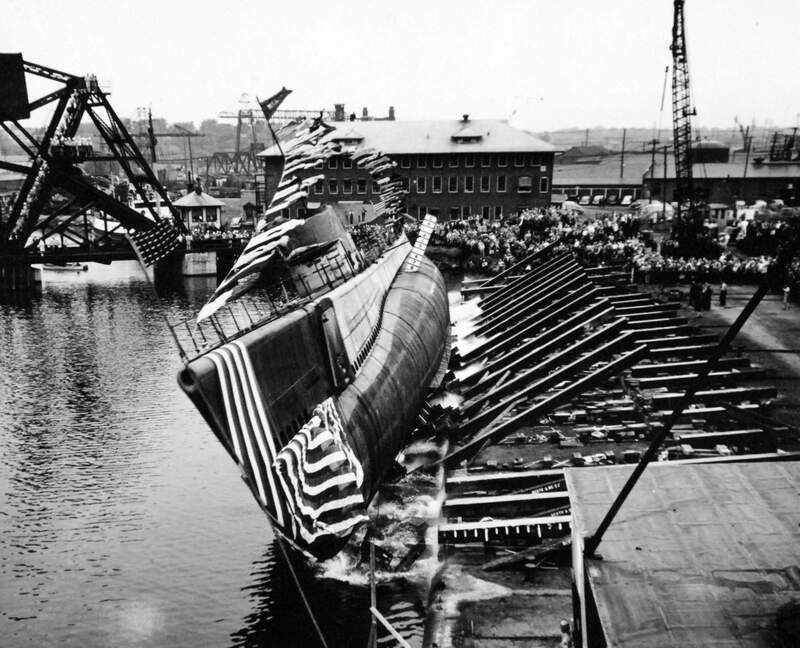 587k Macabi (SS-375), at launching at the Manitowoc Shipbuilding Company, Manitowoc, Wisconsin, 19 September 1944. 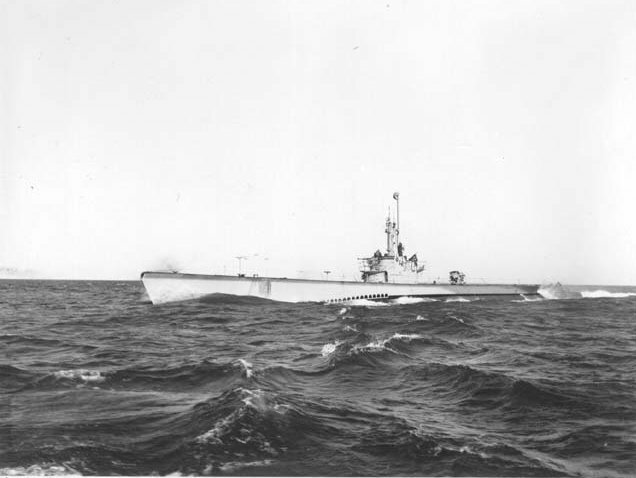 USN photo # 80-G-409537 courtesy of National Museum of the U.S. Navy. 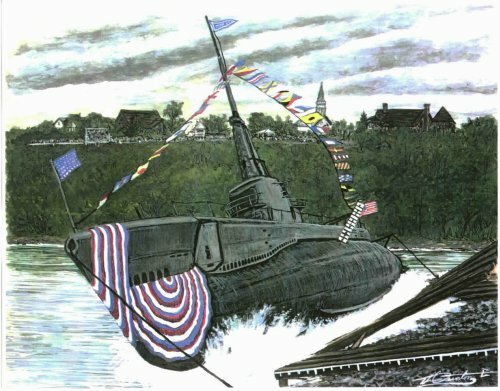 55k Watercolor print by the artist Tom Denton of the side launching of a Manitowoc built boat. Courtesy of submarineart.com. 55k Macabi (SS-375), gets help from tugs immediately after being launched at Manitowoc Shipbuilding Co., Manitowoc, WI., 19 September 1944. Photo by Harry Berns, Official photographer of the Manitowoc Shipbuilding Co., Manitowoc, WI. 51k Macabi (SS-375), signal flags waving in the breeze, starts to move just after being launched at Manitowoc Shipbuilding Co., Manitowoc, WI., 19 September 1944. 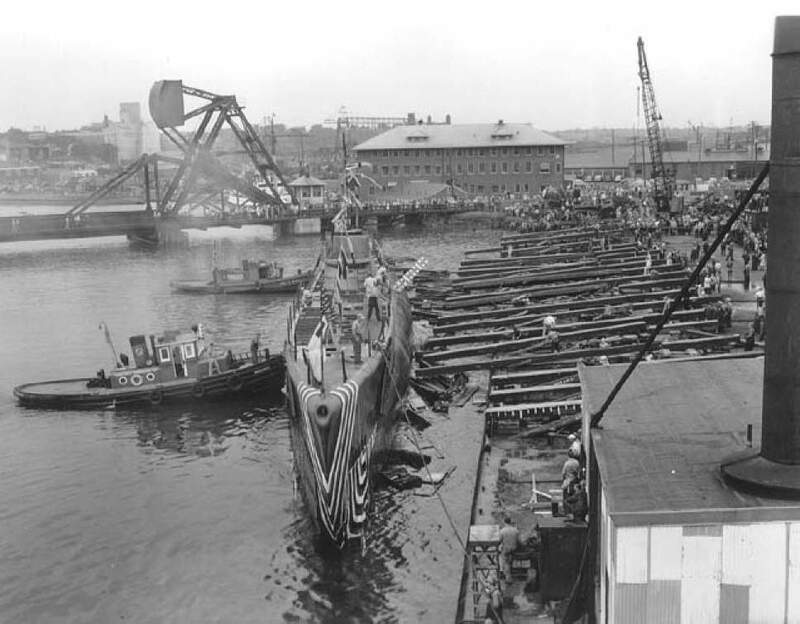 Note the launching logs from the ramp floating off her port side. Photo by Harry Berns, Official photographer of the Manitowoc Shipbuilding Co., Manitowoc, WI. 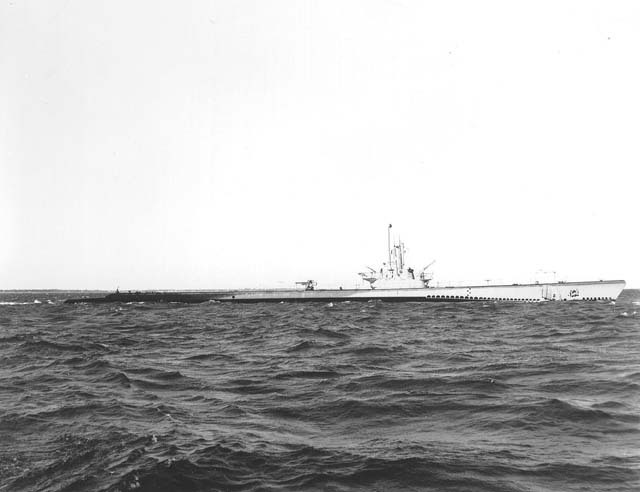 89k Macabi (SS-375), starboard quarter view, under way on Lake Michigan during her sea trials, 19 September 1944. National Archives photo # 19-N-82170 by Harry Berns, Official photographer of the Manitowoc Shipbuilding Co., Manitowoc, WI. 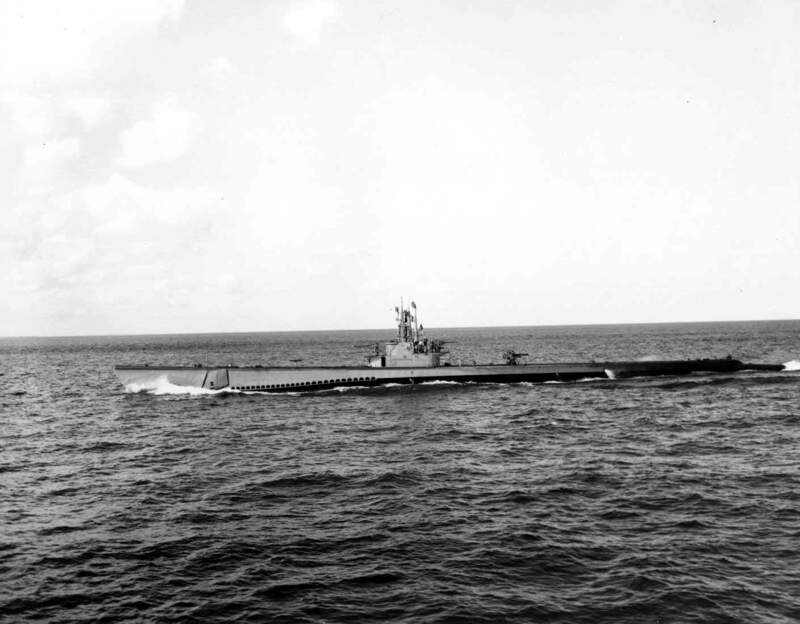 33k Macabi (SS-375), starboard view, under way on Lake Michigan during her sea trials, 19 September 1944. Photo by Harry Berns, Official photographer of the Manitowoc Shipbuilding Co., Manitowoc, WI. 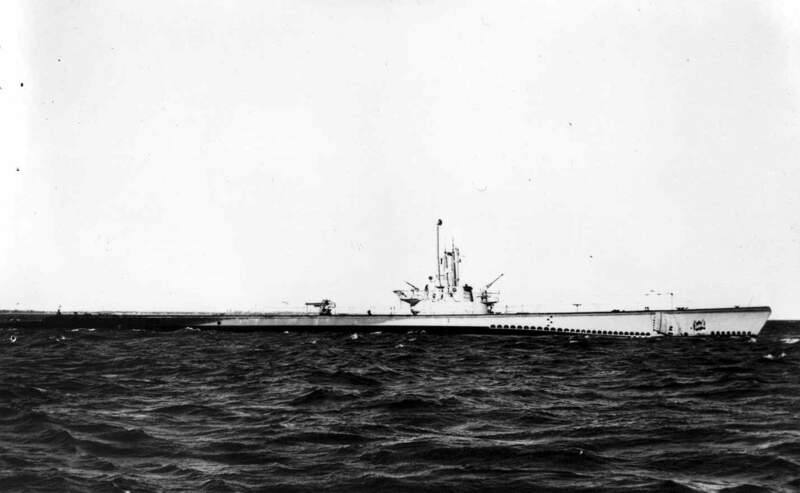 39k Macabi (SS-375), port side view, undergoing sea trials on Lake Michigan, July 1944. Photo by Harry Berns, Official photographer of the Manitowoc Shipbuilding Co., Manitowoc, WI. 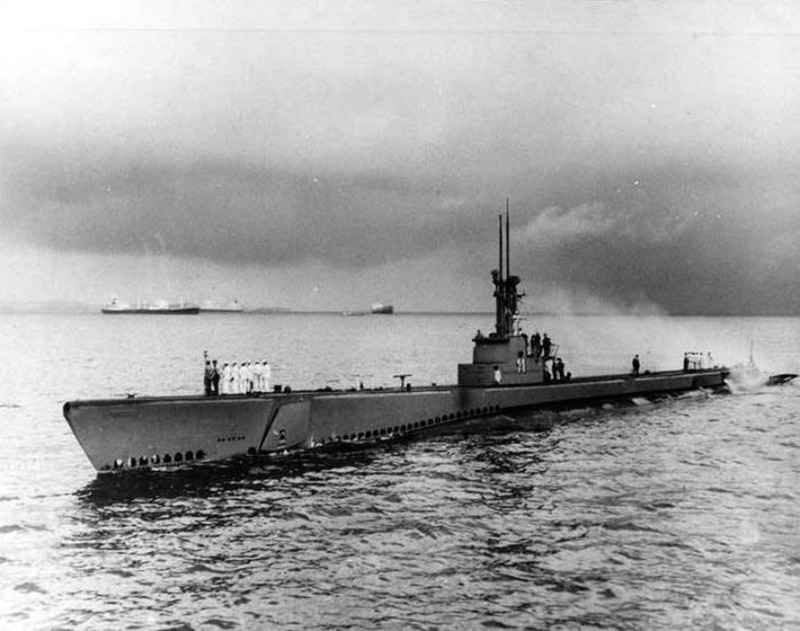 130k Macabi (SS-375), port side view, undergoing sea trials on Lake Michigan, July 1944. Photo by Harry Berns, Official photographer of the Manitowoc Shipbuilding Co., Manitowoc, WI. 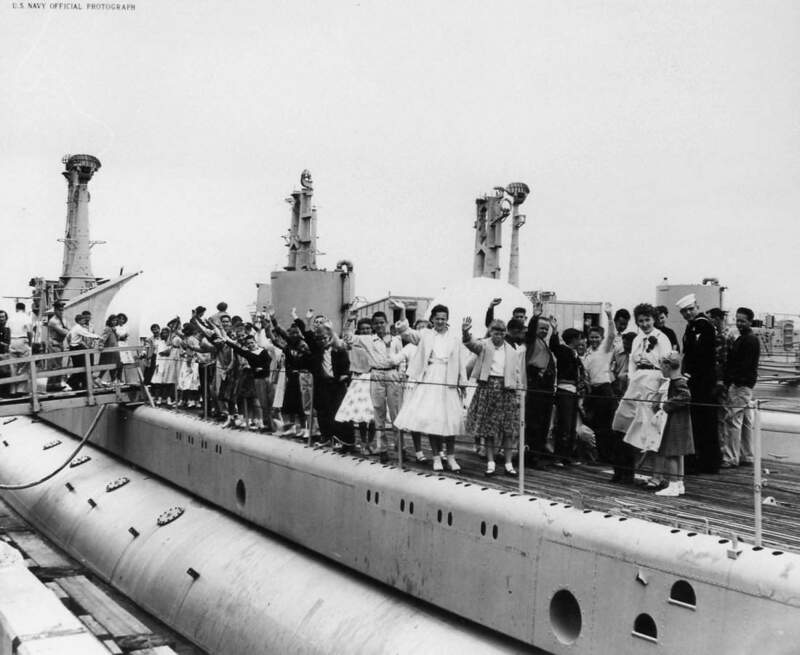 90k Visitors to Mare Island on Armed Forces Day are topside of Macabi (SS-375), on 19 May 1956. 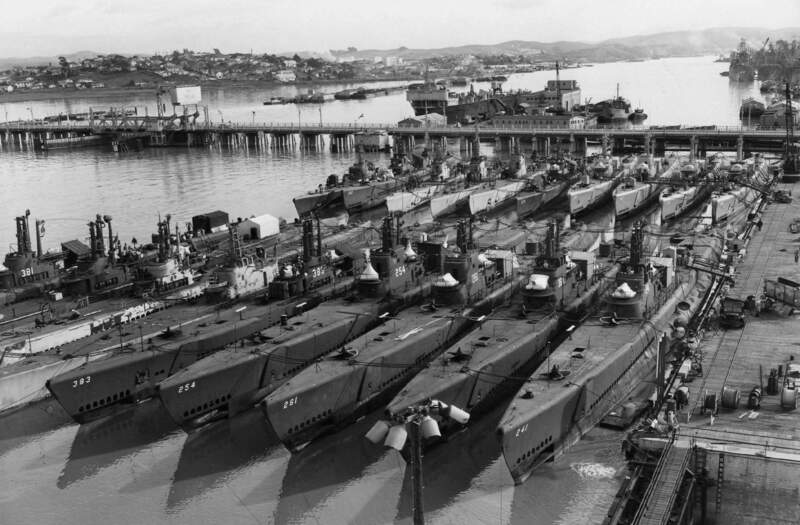 She is berthed in the reserve fleet and I'm not able to identify the other submarines in the photo. 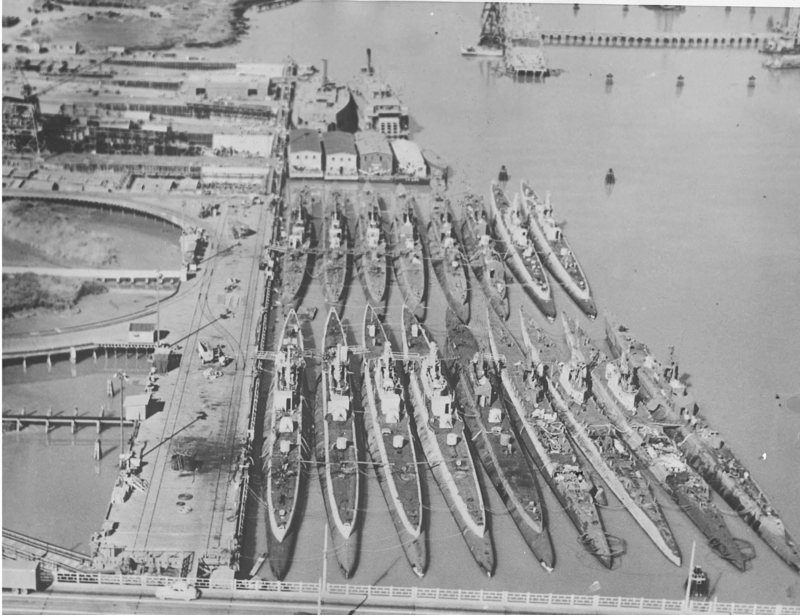 USN photo # 29393-5-56, courtesy of Darryl L. Baker. 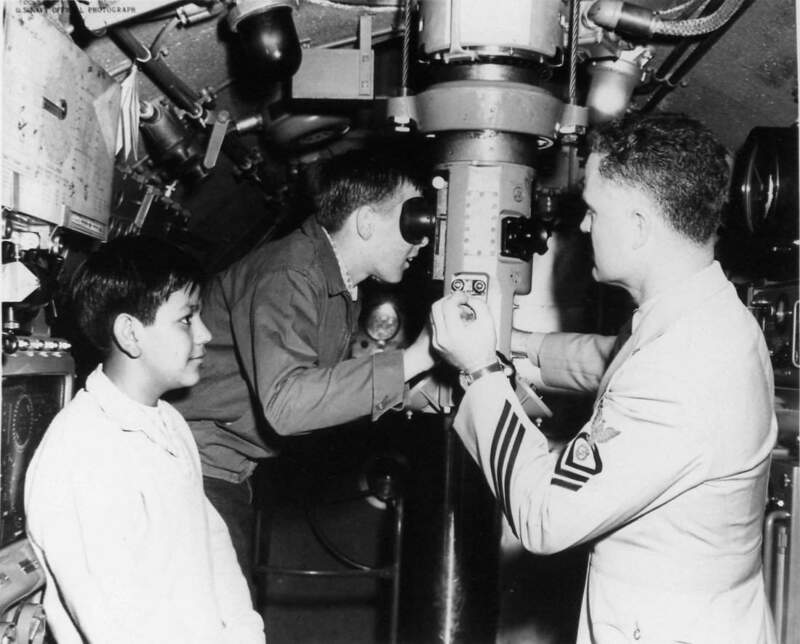 91k Visitors are assisted looking through the periscope of Macabi (SS-375) at Pacific Reserve Fleet, Mare Island on 19 May 1956. USN photo # 29394-5-56, courtesy of Darryl L. Baker. 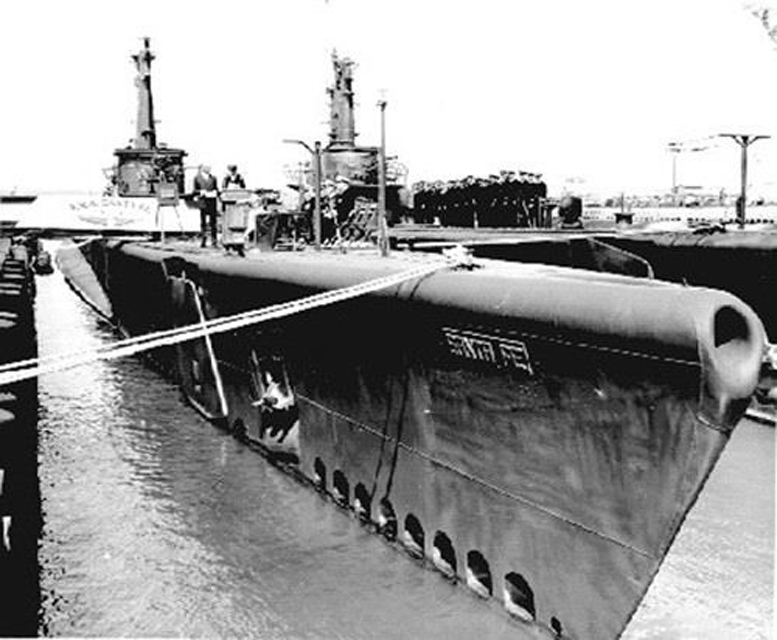 195k Left to right ex-Macabi (SS-375) as the Santa Fe (S-11), Sennet (SS-408) & ex-Lamprey (SS-372) as the Santiago Del Estero (S-12), 30 September, 1963. Photo courtesy of John Hummel, USN (Retired). 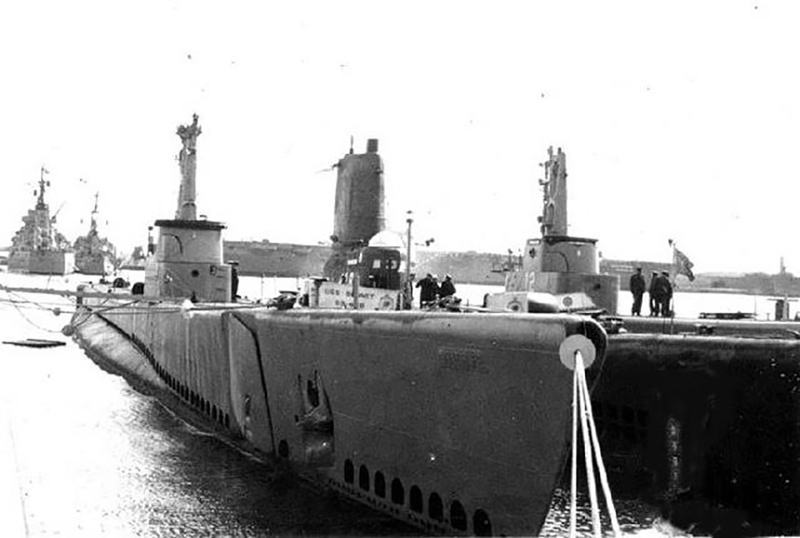 232k Undated image of the submarines ex-Macabi (SS-375) as the Santa Fe (S-11) and ex-Lamprey (SS-372) as the Santiago Del Estero (S-12), at Mar del Plata. Photo i.d. courtesy of Larry Derouin. Photo courtesy of histarmar.com.ar via Robert Hurst. 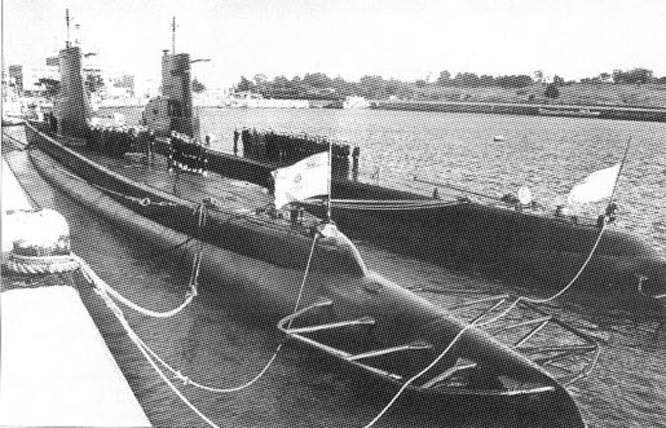 101k Santiago Del Estero (S-12) & Santa Fe (S-11) tied-up alongside side each other during a ceremony at Mar del Plata, July 1970. 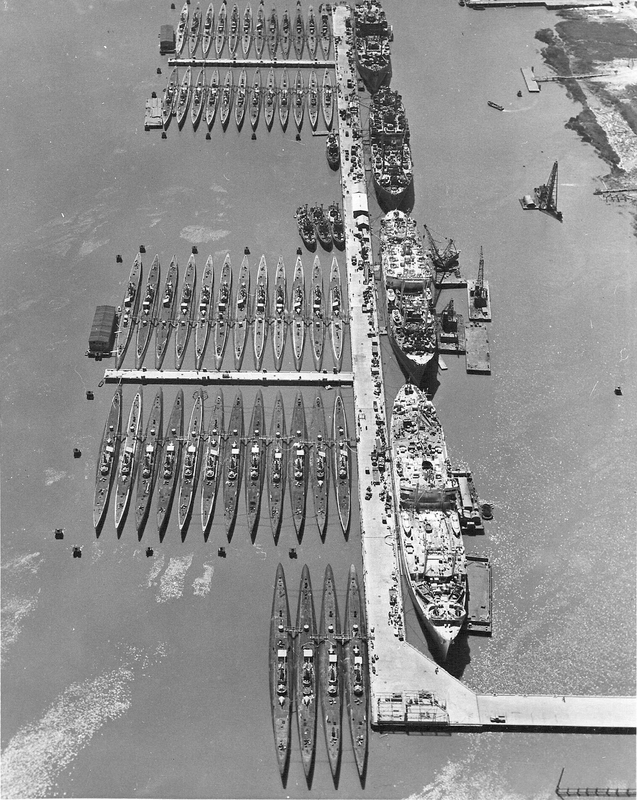 Note the different sails of the two submarines. 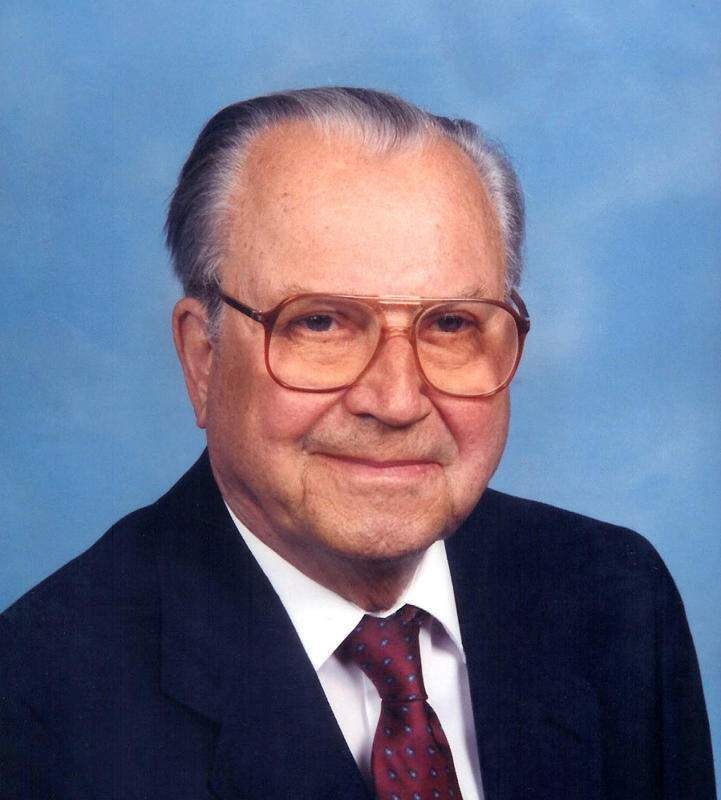 Photo i.d. courtesy of Larry Derouin. 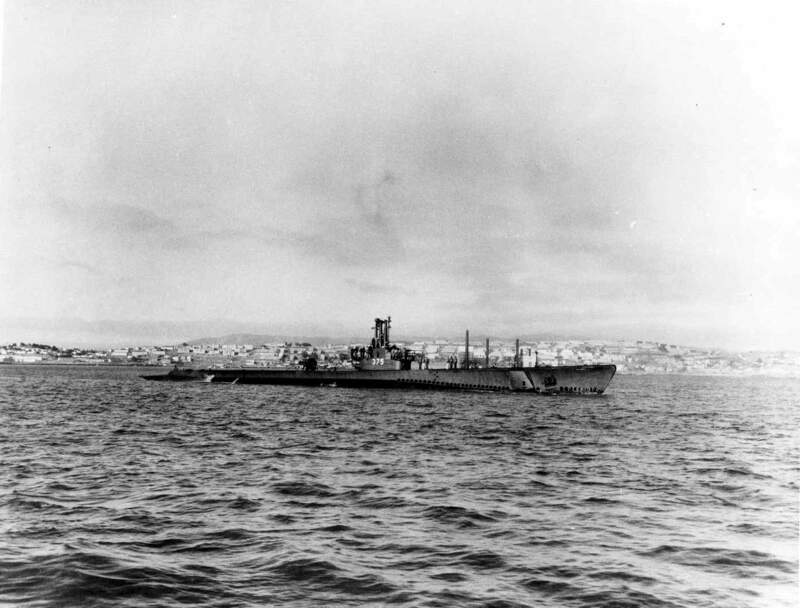 132k Undated picture of Santa Fe (S-11) on trials after having been transferred to Argentina. 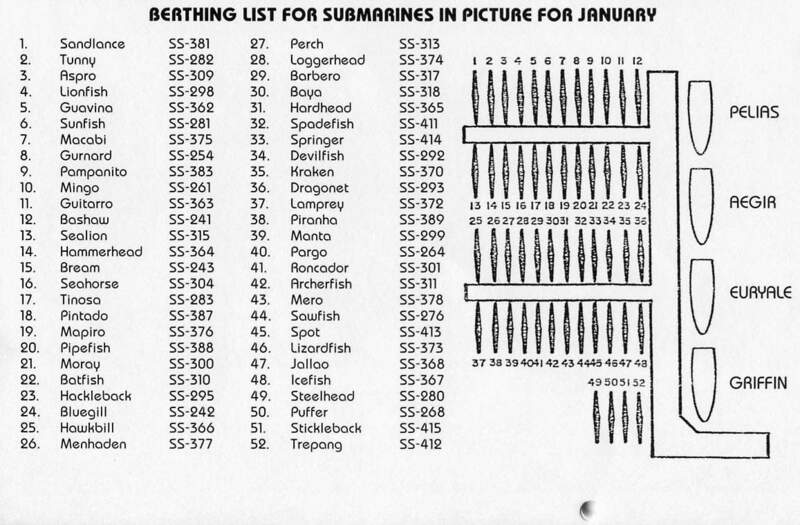 Photo and text from The World Encyclopedia of Submarines by John Parker courtesy of Robert Hurst.